Founded in April of 1966 as Arnold Business Forms, our company was originally created to offer traditional handwritten, continuous and unit set business form products. Over the years, as technology transformed the business world, our product offering changed along with it. 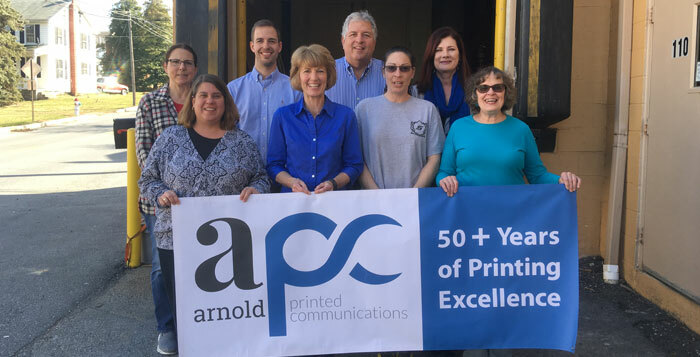 Today, Arnold Printed Communications is one of the top printing distributors in the United States, combining state-of-the-art technology and expert print consulting to handle the printing needs of a wide variety of businesses. Owner and President of Arnold Printed Communications, Craig has worked for the company for over 38 years. Craig's father started the company in 1962 and Craig began working in the family business in high school, going on customer calls with his father. Craig learned the business from the ground up, working in manufacturing plants to gain hands on experience with offset and flexo (label) production. He says this early experience helped him to understand and visualize customer production solutions, while developing skills for fast analysis and correction to remedy those rare customer production problems. Craig has been involved with the Lancaster Sertoma Club for over 30 years, raising money to support and improve Long's Park, at-risk kids camp and hearing testing. During his 30 years with Sertoma, the organization has raised $2.4 million to help the community and support projects including the Longs Park Amphitheater and the founding of the Amphitheater Foundation, which now operates as an independent organization. Craig has three grown sons and an immature basset hound named Mildred. Barbara has worked for Arnold Printed Communications for over 25 years. As an Account Executive she handles sales and account/inventory management for clients. Barbara enjoys meeting new people and learning about a variety of companies. She particularly enjoys solving problems for her clients and sourcing the best products for their needs at the most competitive prices. One of her strongest skills is inventory management and she enjoys the challenge of managing inventories for national accounts with multiple locations. She says the constantly evolving nature of the printing industry keeps her job interesting, challenging and enjoyable. Barbara began her sales career with Moore Business Forms (now RR Donnelly), graduating from their print training school and winning the highest honor in the Moore Achievement club during her first year with the company. In her spare time, Barbara enjoys spending time with her husband Matt and their rescue dog, Jack, a beautiful, black Chow/Lab mix. She also enjoys a host of outdoor activities including sailing, golf, hiking and biking. When it's too cold to be outside you'll find Barbara reading, doing crossword puzzles or binge-watching Netflix series. Barbara volunteers at Schreiber Pediatric Rehab Center and enjoys interacting with young adults in the Children's Bowling Program. She also volunteers with the Lancaster Ladies City-County Golf Association (LLCCGA), promoting friendly competition among golfing women. She and her husband proudly support The Lancaster Project for the Needy, The Sebastian Foundation for Animal Rescue, and Best Friends Animal Rescue. Doug has worked for Arnold Printed Communications for 2 years. Representing the third generation to work for the company, Doug currently handles sales and inventory management. Doug most enjoys working with clients to problem solve around budget constraints and expand creative ideas, while creating amazing working relationships through trust, management and quality control. Doug's family includes his two 'barbaric' older brothers, Tom and Andrew and his parents Craig and Susan Arnold. Both Tom and Doug received their undergraduate degrees at Penn State. Tom is currently working on his PhD in geology from the University of Florida. Doug's brother Andrew went to the Culinary Institute of America and now lives in Del Ray, FL. The family also has a dog named Mildred, who Doug says is the laziest basset hound you will ever meet. He also rescued a cat named Rex. He has a pet Costa Rican red eyed frog in his office. He is a two-time Golden Breast award winner at the Sertoma Chicken BBQ. Anyone who wants to argue against why the 76ers are the best team in the NBA can call him on his cell phone. Kathy has been with Arnold Printed Communications for over 20 years. As Office Manager, she handles financial statement reporting, cash flow management and cost control, and sales support, along with day-to-day management of the office. She appreciates being part of a team with a positive attitude that works hard and cares about doing a good job. She says problem solving as a team is a very satisfying part of her job. Prior to her work at Arnold Printed Communications, Kathy worked at Armstrong and Herley Industries in various accounting positions. Kathy is married and has two adult children and a yellow lab. She is a charter member of The Empty Nester Bike Club and enjoys riding in the bucolic countryside of Lancaster County. Kim joined the team at Arnold Printed Communications 8 years ago and currently handles customer service relations. A self-admitted people-pleaser, Kim loves serving and meeting the needs of customers and the sales staff. Kim has three adult children and a 5-year old granddaughter. When she's not working, Kim enjoys spending precious time with family and also engages in a number of hobbies including cooking, riding her bike, and going to yard and estate sales. She is very active in the community, volunteering her time at the Water Street Rescue Mission twice each month. Kim is member of the Meal Ministry program at her church and also enjoys serving food to the music and tech team at church each month. Deb joined the Arnold Printed Communications team 10 years ago and currently works as a Sales / Program Administrator, placing orders and handling receiving and invoicing duties. She most enjoys the people she works with every day. A veteran at Arnold Printed Communications, Melissa has worked for the company for over 20 years. She currently works in shipping and receiving and most enjoys the amazing, creative people she works with. Judy has been a part of Arnold Printed Communications for 23 years. She currently assists in the office and warehouse, enjoying the variety of her work. She also welcomes the opportunity to expand her knowledge of distribution from start to finish. Prior to her work at Arnold Printed Communications, Judy worked for Armstrong for 26 years in a variety of positions. She has over 49 years of experience being an outgoing team member who enjoys helping out wherever she is needed. Judy has 3 children - Chad, Sheri and Kristi and 2 grandchildren, Miles and Luca. Her daughter Sheri is expecting her second child later this year. Judy is a big fan of reality TV and also enjoys spending time with her cockapoo named Dusty, who will be 16 in April.